Jacques Tati was voted one of the 50 Greatest Directors of All Time by Entertainment Weekly. L’École des Facteurs is rated 7.5 by IMDB, which puts it ahead of many popular features including Easy Rider, Godfather Part II, Titanic and Batman. This movie is on the Criterion Collection DVD for Jacques Tati’s Mon Oncle, which is available for rent through Netflix. In the dance sequence, Tati throws in some pretty funny pedaling moves. How do you suppose Tati got the bicycle to travel sans rider for so far? 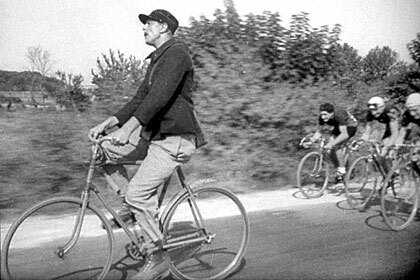 Tati overtaking and then dropping the peloton of racers on his clunky carriers’ bicycle is perfect. 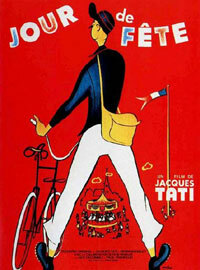 Be sure to see Jour de fête (Festival Day) for more of Tati’s bicycle comedy. Tati won the Best Foreign Movie Academy Award and the Cannes Festival Award in 1958 for Mon Oncle. 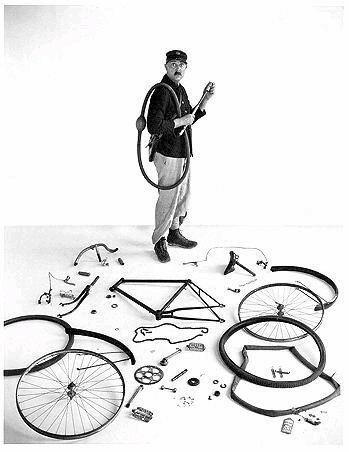 Jacques Tati was born October 9, 1907 and died November 5, 1982.